OK, I just harvested a bunch of Chinese Water Chestnuts, Eleocharis dulcis. I’ll post some pictures of how I grow them, once the images are downsized. Meanwhile, since I can’t refrigerate all of them or eat all of them in a timely fashion, I was hoping to find information on how to can them. I’ll use mason jars to avoid metallic tastes. If there’s a recipe for how to can/preserve them, it’s hiding! I know about the lemon juice and/or citric acid to prevent browning. At some level, it may help prevent botulism. I don’t want to freeze them as they’ll turn to mush. I could make up a pickled water chestnut recipe, but I’m looking for basic canning information. Any help is appreciated! Yes, I get the low acid part. I do a ton of canning and food processing. I’d have to add enough citric acid to get a pH of 4 before water bath would work. But that would taste terrible! I’d be better off pickling, where the vinegar drops the pH. I’m looking for guidance on how long, at how many pounds of pressure. The starch in Water Chestnuts is pretty durable; that’s why canned ones are still crunchy. I guess I could experiment with 15 lbs. pressure for an hour and see what happens. I’d hate to ruin the product, especially after all the peeling! Maybe canned Chestnuts (Castanea) would be similar? 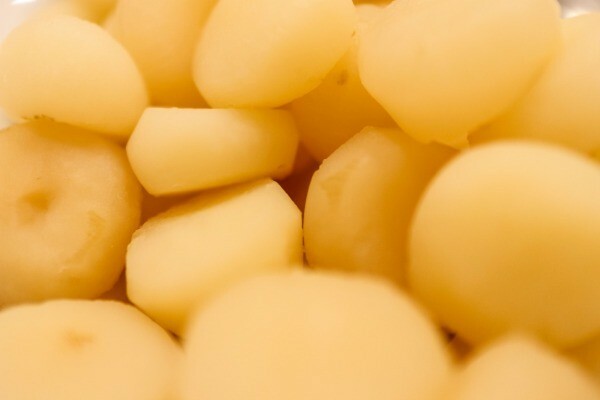 This is a guide about freezing water chestnuts. 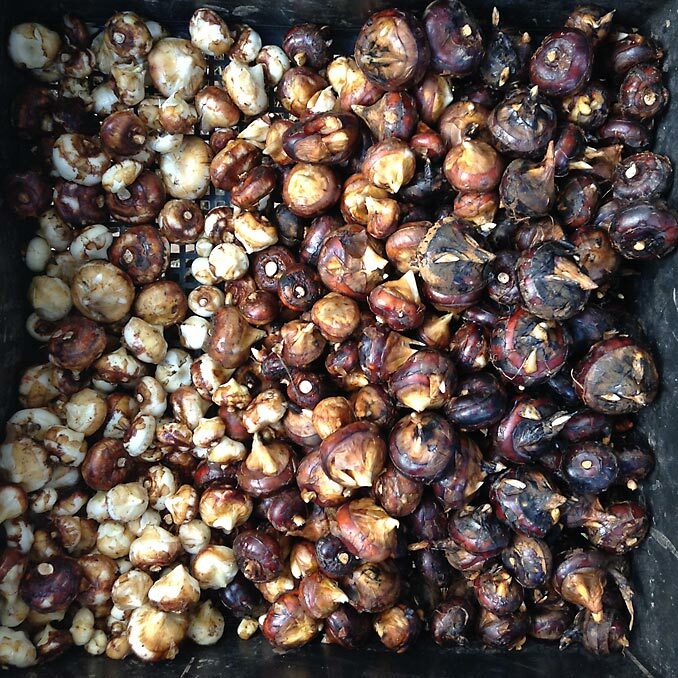 If you will not be using all of the water chestnuts you purchased in your recipe, freeze the rest for later. I think it’s worth trying the peel and freeze raw method with a few to test. Just freeze overnight and then defrost and cook the next day. I feel like since they’re frozen raw you can abbreviate the cooking time and hopefully retain some crunch. Thanks for the concern and suggestions! First, I’m a Biologist by training, and grew up working in a lab where I sterilized all kind of nutrients, grains, etc. for controlled culture. I’ve been canning foods since 1982, without incident and have studied food safety all my life. My pressure cooker is a dial-type and I’ve safely canned chili, beans and many low acid foods. The citric acid is not for acidifying, per se; it’s to prevent discoloration. To determine final pH of a food product, after the food has equalized to the “brine”, the food must be cooked to rupture (in this case) plant cells and enough time must pass for osmotic movement to equalize. This could take a month or more. (Think pickles having the vinegar fully reach the cuke center and the pickle brine gets weaker.) I’m not interested in acidifying to the level where it’s an acid food, unless I make proper pickles. I have a pH meter, so can always double check food acidity, if needed. I know the WC plants are not adapted to freezes. Dormant corms are stored in my refrigerator for the winter. Freeze-adapted plants usually can move water out of cells, at low temperatures, to keep their cells from freezing as hard and their cells from exploding due to ice. Since WC don’t seem to have this capability, there’s not a lot of hope for the freeze method. Frozen, they may keep 6 months before the flavor goes off. Canned, they should be safe for at least 18 months, provided the vacuum-seal is intact. Looks like a couple trials are in order. A different approach. My buddies mother makes these. Candied eh? Sounds tasty! Might try a few that way, too. So here’s the mini-pond setup. I dug out a spot on the side to drain several inches of water, which normally sits above 5-6 inches of soil, at the bottom. At harvest, I tear off a manageable chunk of “sod” and flip it onto the bank. 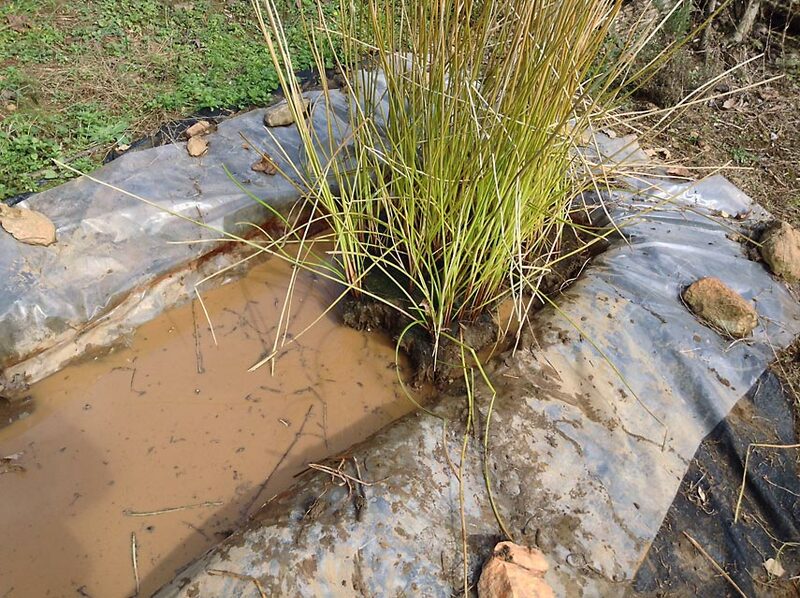 Most of the Water Chestnuts form where they hit the liner, made of greenhouse film on top of weed cloth. After the corms are harvested, they’re blasted off with water. Eventually, they’ll get sorted. The young, white corms won’t keep, so get eaten first. The darker ones, with thick skins keep awhile in the fridge. I choose the largest to replant. Fresh Water Chestnuts are very different from canned! They’re sweeter, nuttier-tasting and fresh/clean. After peeling, they get dropped in a bowl of water acidulated with lime juice, to prevent discoloration. Citric acid will also work. After a few minutes, the raw, peeled corms can be drained and kept in the fridge for a few days, before cooking. Put a bunch in last night’s Thai Karee shrimp curry with coconut milk, fresh lemon grass and galanga…lovely! Incredible. I am duly impressed. What good fortune. Thanks! It’s kind of a lot of work; not bad, since I enjoy growing all kinds of vegetables. This year, rains were relentless, unprecedented rain almost every day from late May to Oct. Sept. had 26 rainy days. The only tomatoes that survived were ones I grafted onto resistant rootstocks. 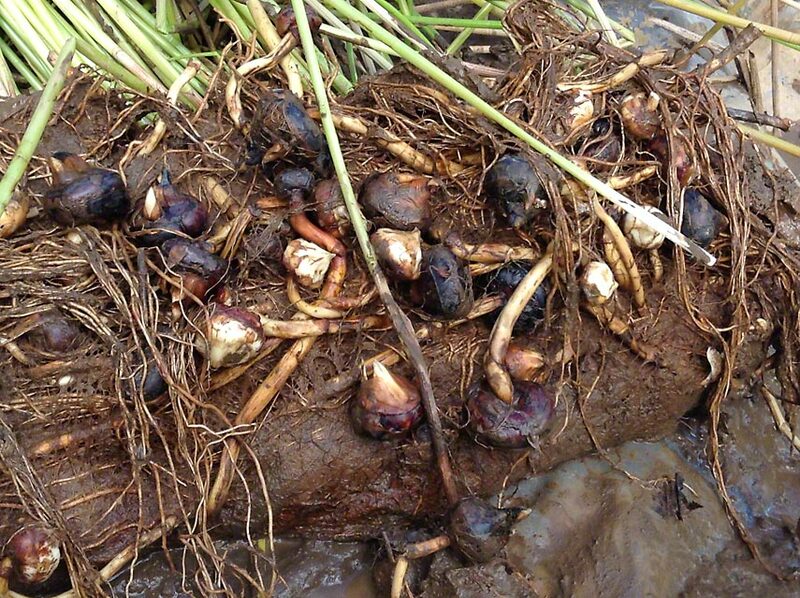 The Water Chestnuts didn’t mind the dark, wet season. What’s strange is that the super hot peppers, like Caribbean Goat and Carolina Reaper did OK. Lots of rot on the sweet peppers and nearly everything else. Even Water Spinach (Ipomoea aquatica) had fungus attacking the foliage! Well, I tried the freezing method and it did not work; the result were mushy, void of that lovely crunch. After freezing, I took half and tossed them into boiling water for a few minutes; the other half were left to slowly defrost. The frozen-into-boiling water were better, but both were unsatisfactory. Now, we know! Fortunately, I just used six of them for the trial. I hope you give a small batch of the candied version a try. Good to know that freezing water chestnuts isn’t worth it. Well shoot, that could have been an easy solve!